I 'mustache' you to enjoy our wacky life.. lol. We love to find fun reasons to celebrate!! 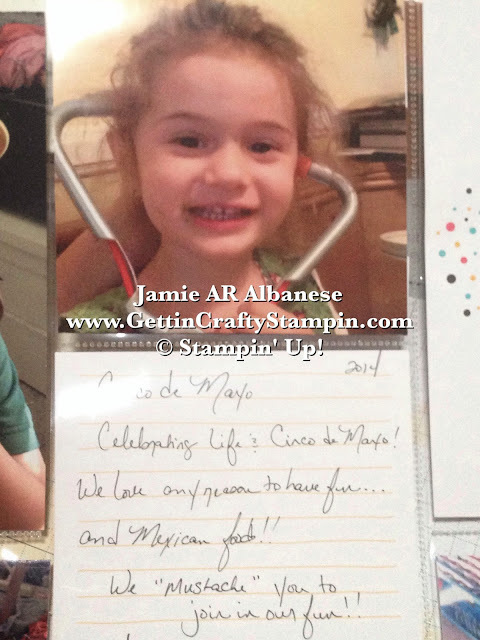 With a healthy love of fun, mustaches and any reason to cook yummy food - Cinco de Mayo (5th of May) is a big deal of fun in our home!! Here, after getting home with the kids - the older two enjoyed putting on a sticky mustache while the younger two napped. We snapped these fun shots before having some awesome Carne Asada tacos and cervezas.. (for the parents) lol. 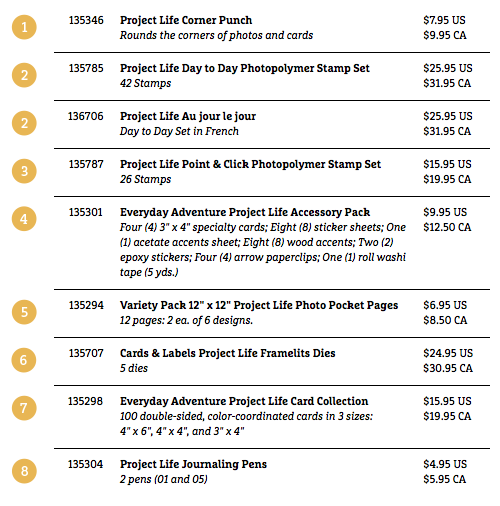 See how easy and fun it is to document your life - while having time to live it!! 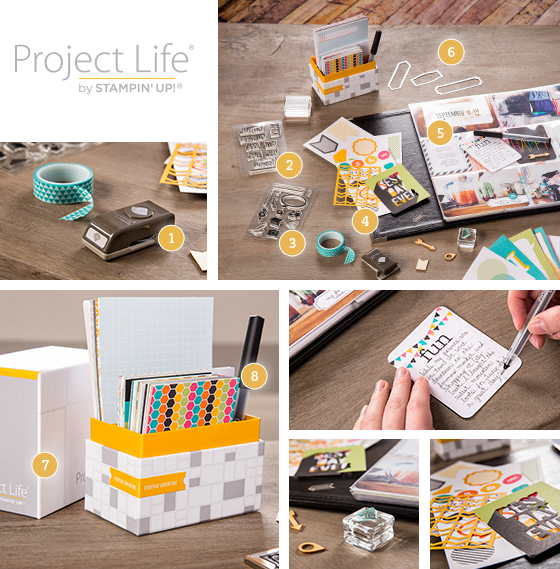 This Project Life system and my Stampin' Up! 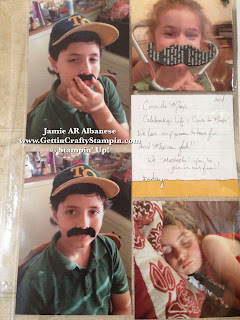 paper crafting tools makes my life fun to document while looking good! It was a hot day, this May 5th.. and my kiddos were pretty tuckered. 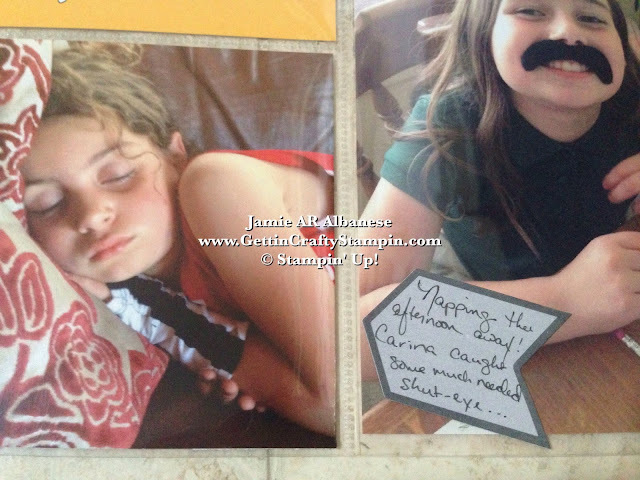 The youngest two snagged naps while I took photos of my kids and their mustache's. So when my baby girl woke up, we were ready for dinner and she missed the mustache-fest. 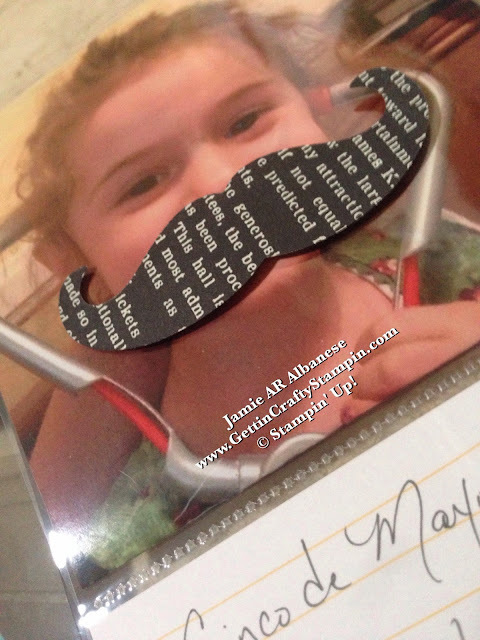 Add a Mustache to go with the page - for a fun and easy accent!! Simply use the Mustache Framelit, our Neutrals Designer Series Paper and the Big Shot with the Magnetic Platform. 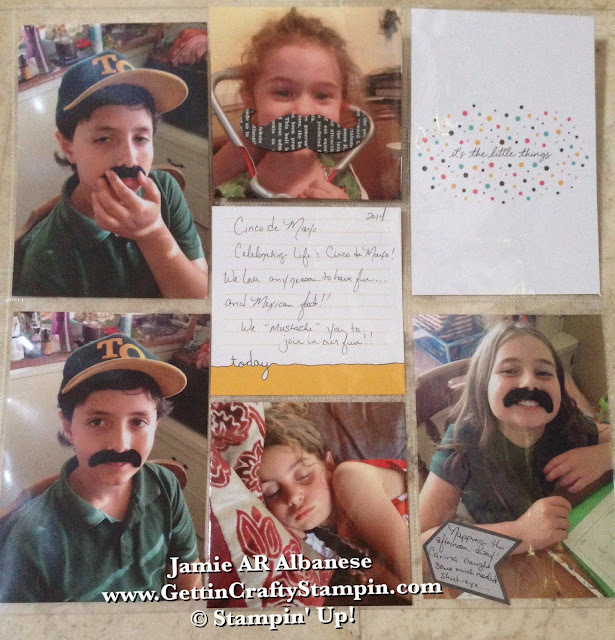 These adorable mustaches can be in any pattern and color - here the black patterned page adds a fun element to this memory documenting! 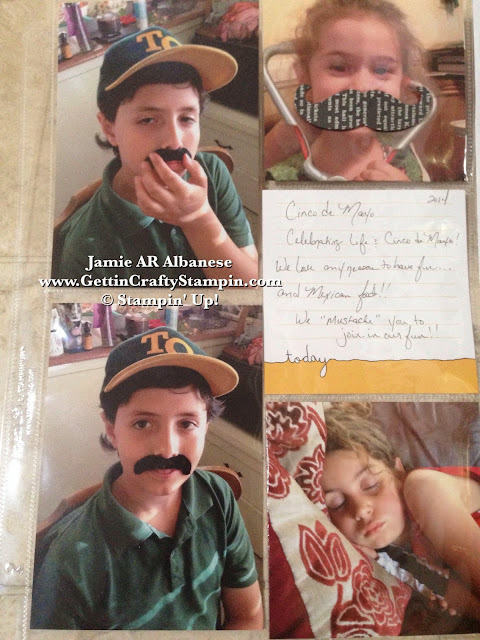 Popping the photo into the page I didn't want to apply the mustache to the picture. I added the Mustache to the outside of the page with the Stampin' Dimensional Adhesive for a cool element on this fun page!! Te, he, he, he... isn't it the cutest thing?? It won't take away from the photo while it does add to the page. Mustache's are pretty 'hipster' but this addition ties into the vaquero (a Mexican cowboy) feel of this page. The Everyday Adventure cards give me some fun accents and a clean but fun area to journal. 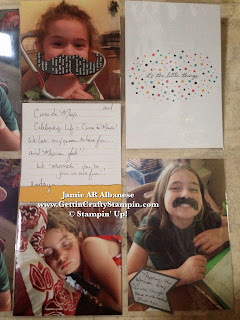 I'm not big on journaling - but this gives me the ideal space to jot down the fun we had. I love the 'it's the little things' card that looks like a party while celebrating the bold colors of Cinco de Mayo and still being clean and nice looking. Our girl napped and never woke up for dinner - this was the best shot of her that day - lol. Adding this small journaling with the Everyday Adventure Accessory Pack and it's die-cuts is an easy way to document our day and her 'participation', lol. Finding reasons to celebrate life is a fun way to add laughter (and plan our dinners - lol). 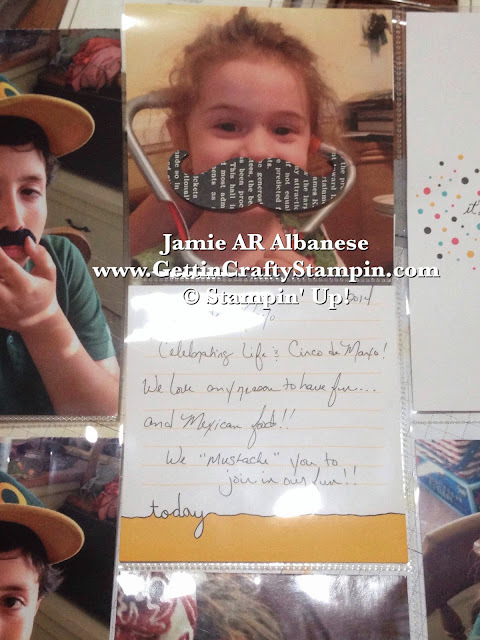 This Cinco de Mayo was a hoot with our Carne Asada and Mustache fun!! I'm a busy mom, wife and business owner - being able to document and celebrate our life has to be efficient and fun. The new Project Life with Stampin' Up! is that and more! I hope that you enjoy this Memory Celebrating Monday.. it's fun to document our life and share it with you! Combining this system and my love of paper crafting with the awesome framelits, stamps, papers and more allows me to get the best of both worlds!